Today I made a new commitment to my goals of flying more regularly. After a long period of deliberation I finally selected a home airport here in Chicago. I have flown out of Schaumburg, Midway and Chicago Executive (formerly Palwaukee) over the past year but had not joined a flight club at either one. 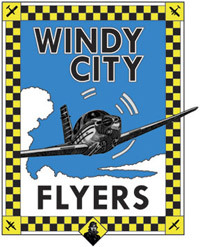 Today, I scheduled a flight with the Windy City Flyers based at Chicago Executive. I have flown with them several times over the past year and had great experiences each time. Again today I had a great experience with the club and one of their aircraft. Getting into the air at Chicago Executive did not take long despite the beautiful weather that drove many a pilot to the airport today. I flew north and took in several landings at Waukegan Regional Airport. During high school I took a class in aviation and my teacher took me flying and we flew out of Waukegan. It was one of my first flights in a small airplane and one I remember fondly to this day. So, it was fun to visit the airport as Pilot in Command today. Visiting Waukegan brought my count for airports visited to thirty one. View my map of airports that I have landed at. After the flight I decided it was time to make the commitment and join the club. By joining I will be able to have better scheduling access to the planes and the hourly rate for the plane is cheaper as members are charged the tach time not the hobbs time. I have my next flight schedule for two weeks from now. I am looking forward to getting back in the habit of flying atleast one to two times per month. Way to go Todd -- looking forward to seeing you flying regularly again! And you know I'm thrilled you've found an FBO in Chicago at last! !